Last autumn I gave evidence to Westminster’s Scottish Affairs Committee as part of their inquiry into ‘the Future of the Oil and Gas Industry.’ With me were professors of climate change, energy and engineering for the token climate change session stuck at the end of a process which mostly heard from the oil industry and their mates. The Committee published their report yesterday and it was clear that none of us need have bothered turning up at the House of Commons. We were speaking just two days after the publication of the much-anticipated report from the world’s climate scientists on the terrible state the world will be in at 1.5ºC of temperature rise, and how much worse things would be at 2ºC (we are already past 1ºC). They did say we have time to stabilise temperatures at 1.5ºC but only if we embark on a programme of “rapid, far reaching and unprecedented” change. They also said that what happens in the next decade is crucial. The Committee’s report turns out to be desperately disappointing and pretty much the same as any group of MPs would have written about the oil and gas industry any time in the last four decades – there is a bright future for the industry and the government should help them get every last drop of oil and whiff of gas out of the North Sea. We’ve known for some years that at least 80% of known fossil fuels have to stay in the grounds but the report has only the most trivial nod to climate change. In a report about the future of the oil and gas industry ! Several bits of the oil industry and a number of oily professors had made written submissions and given evidence in previous sessions. Amazingly, not one of them made any meaningful mention of climate change. The best they could do was talk about the carbon emissions associated with extracting oil and gas, but not at all about the consequences of actually burning it. The Committee have fallen for this trick and their toughest recommendation is to simply urge the industry to shave a bit off the 3% of UK carbon dioxide emissions that come from oil and gas extraction while ignoring the 91% of our emissions that come from actually burning the resulting oil and gas (the rest is from coal). In evidence the UK minister suggested the industry could still be there in 30 to 40 years. One submission from the industry talked about operations in the North Sea in 50 years’ time. Using an anylsis by researchers at University College London shows that playing our fair part in reducing global emissions means that figure has to be more like 10 to 15 years at current rates of production. Obviously the first thing we should do is stop looking for new oil and gas. What about Carbon Capture and Storage? The get-out-of-jail free card is carbon capture and storage, a technology which may be technically feasible but is certainly not economically viable. And it won’t help with emissions for cars or domestic boilers at all while even for industry it leaves about 10% of emissions still being emitted. The only fossil fuel power station left in Scotland burns gas at Peterhead but is certain to be shut long before any full CCS network could be built. Two failed government competitions over more than a decade have resulted in no trials of CCS in the UK. 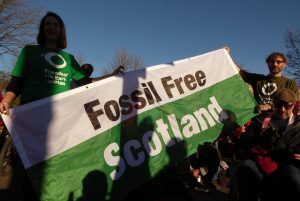 Even the Scottish Government, which is very keen on carbon capture, only includes it as a possibility in its climate and energy plans sometime in the mid 2030s, which is too late to help meet climate targets. Climate change is an existential crisis for human civilisation and this report could have marked a turning point by acknowledging that we need to leave most of the fossil fuels we know about where they are. Instead it fully sanctions the industry to continue to fry the planet. The oil industry’s continued denial of the need for change is disappointing but not really surprising. But those who should be leading us out of this crisis are also in denial about the scale of change that is necessary. The oil industry must be laughing all the way to the bank but all of us would feel the consequences of this failure to take climate change seriously. Instead of business as usual what we really need is an immediate halt to all new exploration, a serious plan to phase out existing production, an industrial plan for the creation of decent jobs in a new, renewable-energy powered economy, and crucially, a just transition for workers and communities currently reliant on the fossil fuel industry. FoE Scotland press release reacting to the Committee’s report here. A shorter version of this blog appeared in the Scotsman on 5th Feb 2019.